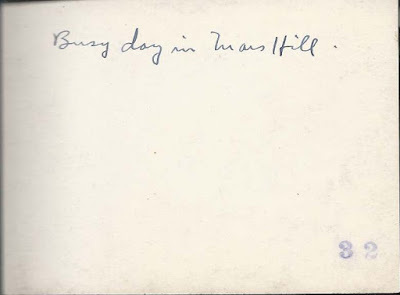 Vintage snapshot of downtown Mars Hill, Maine, with text on the reverse: Busy day in Mars Hill. I'm assuming this was a facetious description of an early morning scene, as Mars Hill has always seemed full of traffic, vehicular at least, when I've passed through, owing in part to its location at the intersection of Routes 1 and 1A. 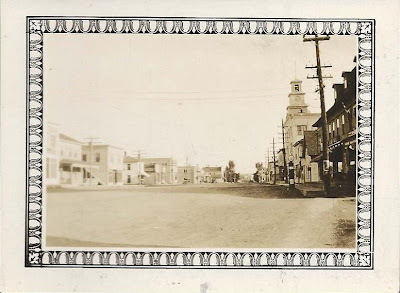 If you can date this photo based on any buildings that might have been demolished, the type of gas pump shown, the electric pole, etc., please leave a comment or contact me directly. Thanks!